Doing the angled grind is a lot of fun; to look right it’s got to be very straight. And, as you get close to the tip, it becomes very thin and you have to proceed with caution (and lots of dips in the water of cooling) to keep from burning the metal. That’s from the billet that I ground and smashed. It hardened really nicely, too – around RC 60, which is a bit crunchy for a regular knife but for something that’s basically supposed to be a scribing-blade, it ought to be OK.
Technically, I should have put it in a vise and whacked it sideways with a hammer a few times to make sure it didn’t snap. I just can’t bear to do that yet. Soonish, I’ll make a few billets I can carve testing-blanks out of, and get all the quenching temperatures and tempering process tuned up. But I am not yet at the point where I feel cavalier enough about my stuff to start smashing it. I think of RC60 as being a nice hardness for a small to medium pocket knife: the sort of thing where the main duty is opening packaging and slicing food, and you’re never tempted to use it as a lever. Not even that once. Very snazzy. The patterning makes me think of a heart monitor for some reason. I wouldn’t worry too much about not having tested it. Its basically a razor knife, yeah? Use it with the assumption that its brittle but at 60 rc, it should also take a mighty fine edge. Are you planning on putting scales on it or leave it naked? Unfortunately if you need to point out that something is not a weapon, then it is a weapon, despite being primarily meant as a tool. Probably not. Kiridashi are usually left as bare blades, sometimes mounted in white magnolia tube-scabbards, but usually not considered worth it. The chisel-grind of the blade should show that it’s not designed as a man-killer, but of course it would still useful as a gangster’s shiv. A hammer at a ballet, if it works it works. Ooooh, that’s nice! I’d like one of those. Very handy to have around, and I am notoriously rough on my boxcutters. Wow! Gorgeous! It looks SUPER useful to me. 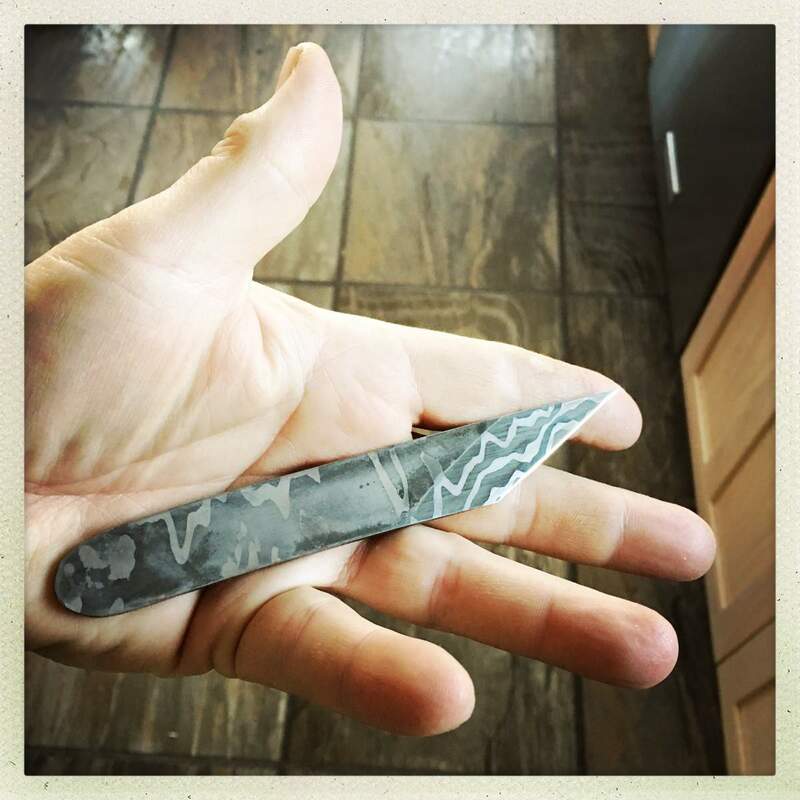 I’ve always just held razor blades in my hand, because I never could afford to buy a handle… now I’m used to doing it that way and do all my leather work just holding the bare blade. To me this looks like a fabulous tool for cutting leather etc. A wonderful use of a beautiful piece of metal. I suspect it would be! The nice thing about chisel-ground blades is that you can run them along a straightedge really easily. I hope this one isn’t too “crunch” tempered. It might cut a steel straightedge.